Music can trigger powerful emotions and brain research has shown the strong link between emotion and memory. Songs and sheet music, also referred to as musical scores, are great primary sources to use with students to enable them tap into the feelings and emotions surrounding historical events and figures. Analyzing recorded songs and sheet music, which often include evocative cover illustrations, can help students better understand the historical context of these people and events and more easily make the connection to universal themes. The analysis of lyrical songs or sheet music, like primary source images, Common Core English Language Arts Standards (CCSS), including grade 6-12 Literacy in History/Social Studies Reading Standards and Speaking and Listening Standards 2 and 3. Digital music recordings can be found in a variety of sections of LOC.gov. You can listen to streaming music via the National Jukebox or access music recordings from the American Memory site and the Performing Arts Encyclopedia (look at the special presentations in the right column), and the American Folklife Center pages. You might also want to check out the extensive list of streaming webcasts about music. The Library of Congress has a rich collection of historical sheet music, containing more than 80,000 digitized items. To narrow your results, try searching within the Performing Arts Encyclopedia or the following American Memory collections: American Sheet Music, 1820-1860 & 1870-1885, African-American Sheet Music, 1850-1920, Band Music from the Civil War Era, Historic American Sheet Music, 1850-1920, We’ll Sing to Abe Our Song! Sheet Music about Lincoln, Emancipation, and the Civil War. In addition to musical scores, you might also want to browse through the America Singing collection of 19th-Century song sheets. Many of the PSN Primary Source Picks resource posts contain sheet music sets, so be sure to check those out as well. To help students analyze music recordings and sheet music, you can have them use the Library’s primary source analysis tool and the lists of guiding questions provided below, which were adapted from this list and this list. You might also want to check out this civil war music primary source set (includes a teacher guide), which includes sheet music along with other types of primary sources. What is the theme of this song? How do you know? What is the title of this music? Who is performing the music? Are any names or places are listed in the bibliographic record? Does the music have lyrics? If so, are the lyrics easy or difficult to understand? What people, places or events do the lyrics describe, explain or discuss? What is the song’s tempo? Are there details that suggest the time period this music relates to? Is the creation date listed in the bibliographic record? If the creation date is listed, was this music created at or around the same time period the content relates to? How does the instrumentation affect the feeling or mood of the song? Why do you think the creator chose this particular tempo? How does the tempo affect the feeling or mood of the music? If there is singing, what is the singer’s style? How does that style affect the feeling or mood of the song? Why do you think this music was created? What might have been the creator’s purpose? What evidence supports your theory? Who do you think was the audience for this music? Does the music show bias through lyrics or tone? If so, towards what or whom? What evidence supports your conclusion? What was happening during the time period this music represents? If someone created this music today, what would be different/the same? What did you learn from listening to this music? Does any new information you learned contradict or support your prior knowledge about the topic of this music? QUESTION: What didn’t you learn that you would like to know about? What questions does this music raise? What do you wonder about . . .
What is the title of this music? What other names or places are listed on the cover? Does the text tell you anything about the type of music? Describe any images, illustrations or designs found on the cover and inside pages. What names or places appear in the lyrics, if present? Are there details that suggest what instruments should be used to play this music? Does the sheet music list the music’s tempo? Are there details that suggest the time period this music relates to? Is the creation date listed on the sheet music or in the bibliographic record? If the creation date is listed, was this music published at or around the same time period the content relates to? How might the instrumentation affect the feeling or mood of the song? Why do you think creator chose this particular tempo? How might the tempo affect the feeling or mood of the music? Why do you think this sheet music was published? What might have been the creator’s purpose? What evidence supports your theory? Who do you think was the audience for this sheet music? Can you hum the melody? If so, how does it make you feel? Does the sheet music show bias through lyrics or tone? If so, towards what or whom? What evidence supports your conclusion? 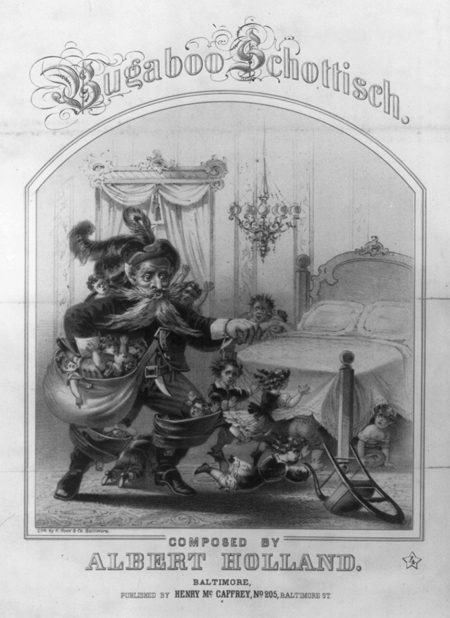 What was happening during the time period this sheet music represents? If someone published this sheet music today, what would be different/the same? What did you learn from examining this sheet music? Does any new information you learned contradict or support your prior knowledge about the topic of this sheet music? QUESTION: What didn’t you learn that you would like to know about? What questions does this sheet music raise? What do you wonder about . . . Please feel free to download and distribute the Audio Music Analysis Guiding Questions document, the Sheet Music Analysis Guiding Questions document, and the primary source analysis tool (but please keep the formats, including logos, intact).